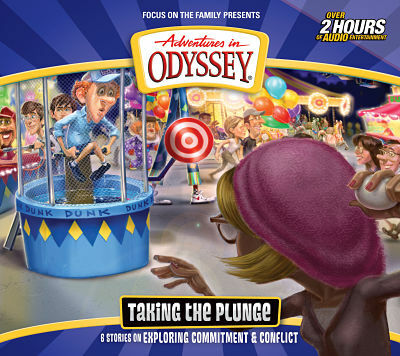 Members of the Odyssey Adventure Club were given early access to Adventures in Odyssey Album 59: Taking The Plunge weeks ago, but now the wait is over for everyone else. Taking The Plunge is now available for purchase digitally on iTunes and Amazon . Physical CD copies will be released on August 1, 2015 and can be preordered on CBD right now. Taking The Plunge will begin airing on radio stations everywhere later this year. Album 59 also marks the beginning of a new era for Odyssey albums. For the foreseeable future, regular Odyssey albums will now be released as 2 CD sets with a total of 6 episodes. Rather than the typical 12-episode album that has been standard for many years, we will now have 2 6-episode albums in each 12 month period. And of course, there will still be an additional 12 more episodes released as OAC exclusives. Focus on the Family has also made the decision to make the first episode from Album 59 available as a FREE download! We don't know how long this offer will last so be sure to act on this offer right away. Get "First Things First" for free here. Grab your copy of Adventures in Odyssey Album 59: Taking The Plunge from one our affiliate partners! Thanks!